9" x 9" Security Yard Signs are printed and suitable for outdoor usage. This durable material resists cracking, peeling and chipping, even in cold weather climates! Signs are designed to be attached to 36" long aluminum stakes (sold at home improvement stores) with double-sided foam tape. Easy installation: 2-sided tape, screw, or staple to wood stakes. Material: Security Yard Signs are made of a durable .055" white polyethylene. Security Decals are printed and are available in 3" x 3"
Security Decals are supplied with permanent, pressure-sensitive adhesive on white vinyl material. By purchasing our fake security signs, user acknowledges that no service is provided and no warranties as to effectiveness of the signs. 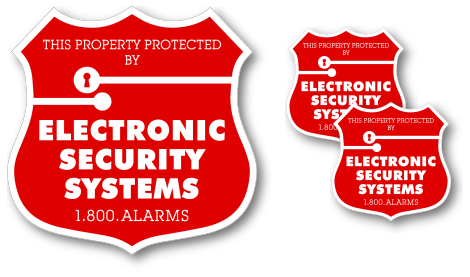 Name and phone numbers on security yard signs and stickers are fictitious and the number 1-800-ALARMS in an incomplete number. 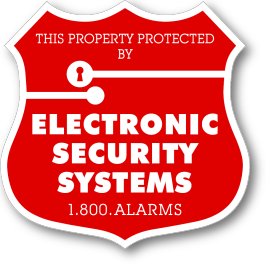 The warning stickers or signs act as a 'visual deterrent' for potential burglars and provide a first line of defense, besides peace of mind, to the users. CustomSecurityYardSigns.com only warranties the quality of the signs and stickers. Please click on the Better Business Bureau link to check our impeccable record! BBB has determined that Designery Sign Company meets BBB accreditation standards, which include a commitment to make a good faith effort to resolve any consumer complaints. BBB Accredited Businesses pay a fee for accreditation review/monitoring and for support of BBB services to the public.